The Court Conch Herald and Court Chanter ushers in our Royal Court, representing the personages of King Kamehameha I and his retainers. 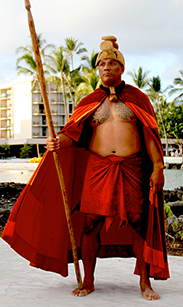 During this procession you will hear a short narrative history of King Kamehameha 1 and His Royal Court. Hawaiian royalty by origin were from the same class of people as the working classes. Leadership gradually became the privilege of the strongest and the most intelligent. These leaders enjoyed the best food, frequent massage by experts, were excellent in the performing arts, traditions, sports and warfare. They came to believe that they were of divine origin and prepared genealogical chants which traced their ancestry to the gods.